Paging your inner Monet! 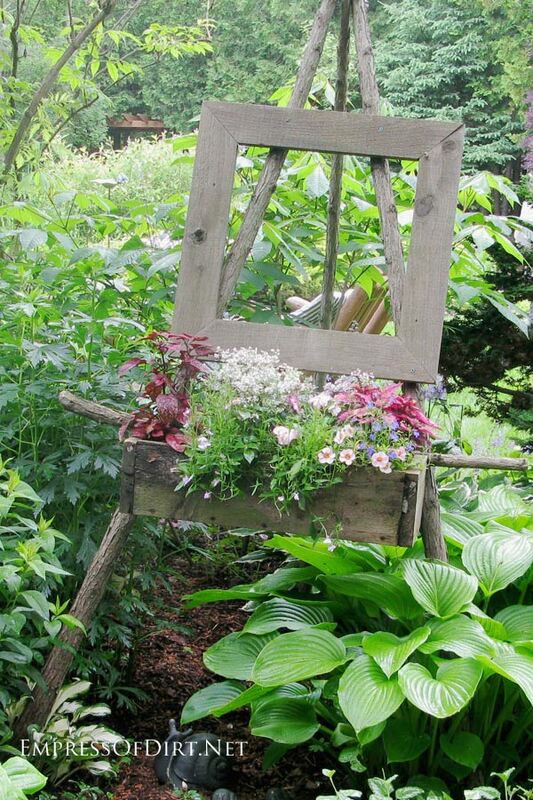 Garden easels can do many cool things for your garden. You can use them as garden art, you can use them to display garden art or plants, and you can use them to display the garden as art. Come see what I mean. If you would like more garden art ideas, have a look down this creative rabbit hole. It’s funny to watch how garden art ideas (or creative ideas of any kind, really) spread. Prior to the internet, it was a slower process, via word of mouth, garden tours, books, and magazines. Today, you can see the same ideas popping up all over the globe within days or weeks of one another. 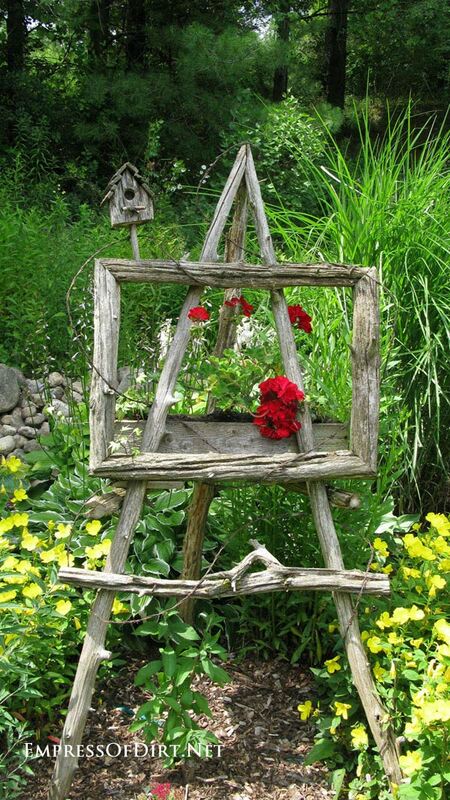 I started noticing garden art easels about ten years ago. I think the trend has waned since then as most I see now are quite weathered (as we like them). And you’ll notice most of these photos are older too. This first one is a favourite with Empress of Dirt readers. I photographed it on a garden tour many years ago. Made from old snake fence rails, this is rustic elegance at its finest. 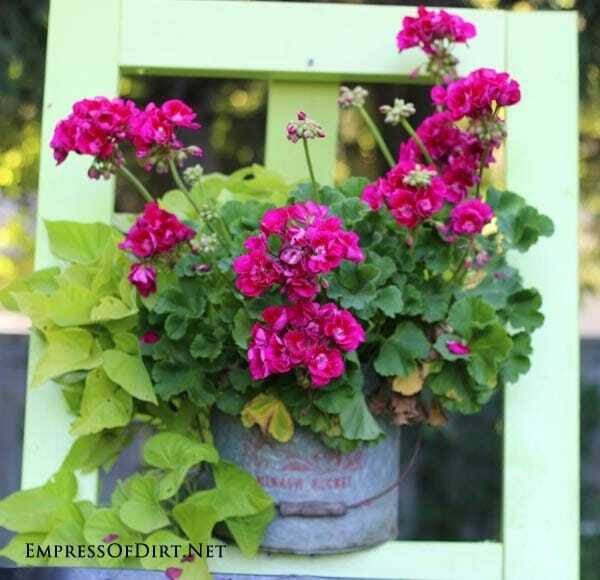 The red geraniums are the perfect touch. 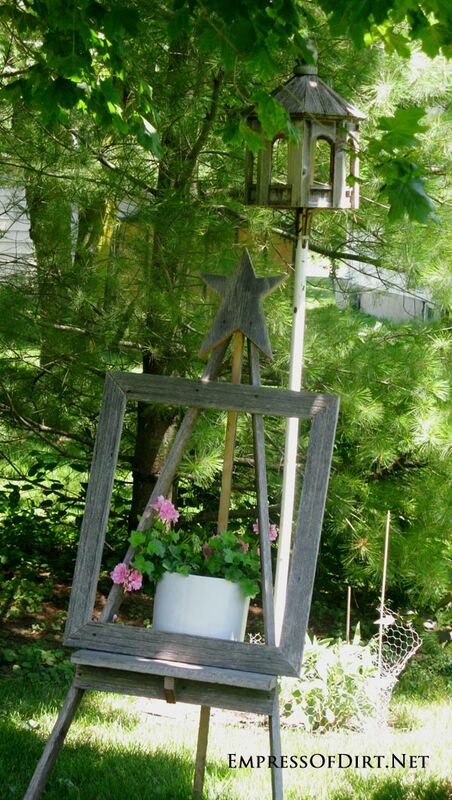 I love the design of this one: notice how the faux planter box is behind the easel and the birdhouse is out front. Works nicely. I got this chalkboard art easel free at the side of the road. I knew I had no place for it in the house but instead recruited it as a plant stand and place to list menus when we have family over for meals on the patio. 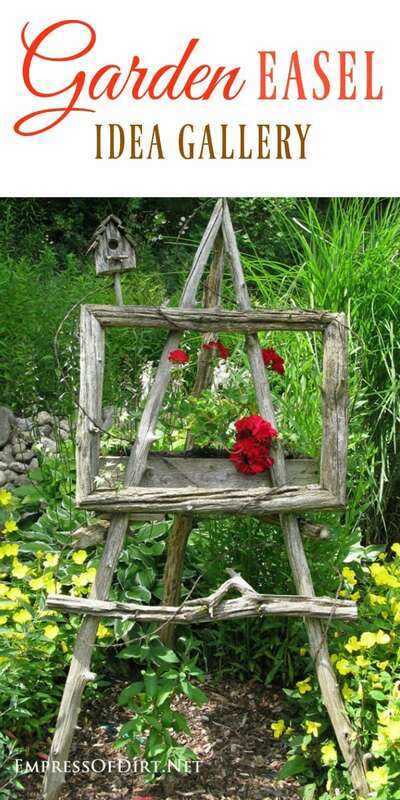 A really simple way to make a garden art easel is to take an existing art easel and add a picture frame to it. 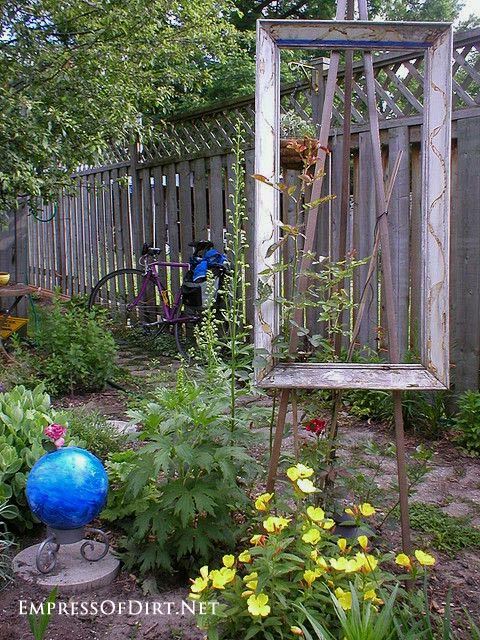 I think this is my favourite effect—where the art is really the garden and the easel just frames it. Here’s another one from a garden tour. The easel is made from what looks like slender cedar branches. 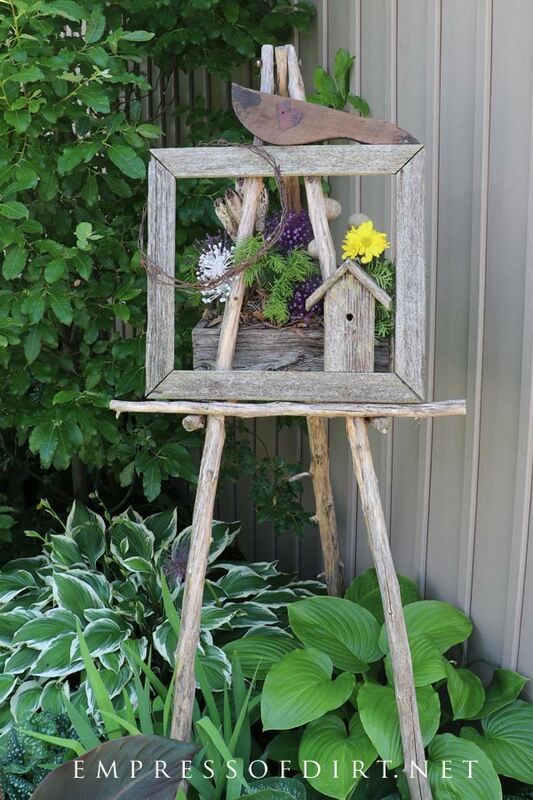 The picture frame is assembled from raw lumber with mitered corners and a rustic planter box completes it. 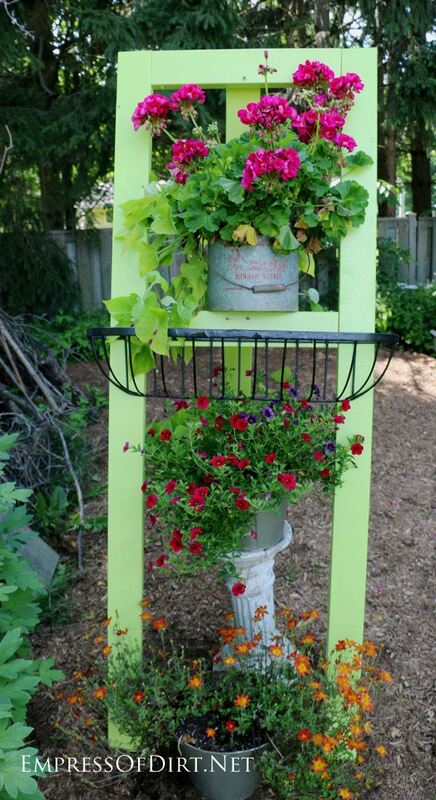 This is a sweet way to add a burst of blooms to any part of the garden that needs a little pizazz. This photo is from years ago, confirming my hunch that these easels have been around for years. 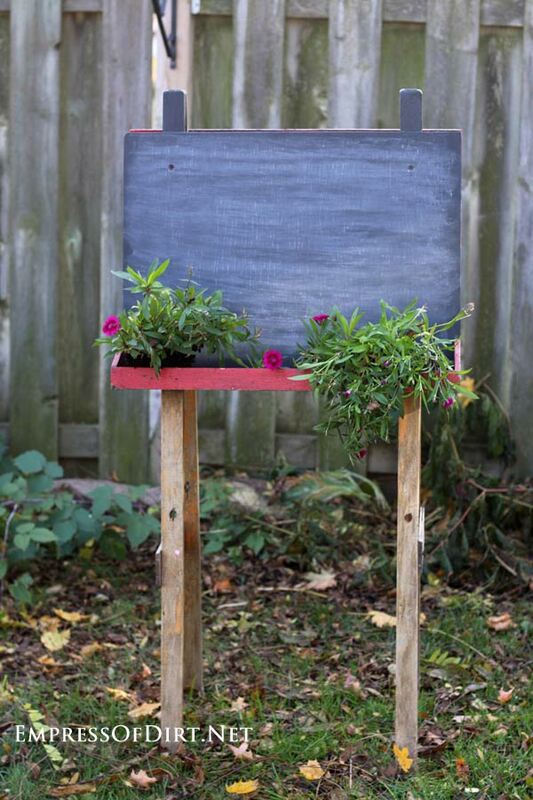 A few readers of the Empress of Dirt newsletter have requested instructions for making a simple garden art easel. Each person said they do not have access to old pieces of fence rail or weather wood and instead requested that I come up with something using simple 2x4s from the lumber store. They also said they don’t own many tools so please keep it simple. Her Majesty has fulfilled your wishes. Here’s what I came up with. It cost $10 to make and took about an hour plus painting time. Watch for free instructions in an upcoming post. Here’s a close up of the frame. I designed it so that it easily holds flower pots plus you can display pictures, mirrors, or whatever floats your wheelbarrow. If you enjoy what you see here at Empress of Dirt, be sure to sign up for the free newsletter for more creative + frugal ideas delivered right to your inbox. Looking for a garden easel or frame or a way to encase and protect a parchment scroll. Found some beautiful garden poems to print and use in the garden. Any ideas, welcomed. It’s tricky to display something printed on paper and avoid weather and UV damage/fading as I’m sure you know. I would have laser copies made at a print shop and use them. The best option may be to attach the laser copies to another surface using Outdoor Mod Podge (many thin coats). See the product for surfaces it works with. Other than that, I don’t know a way that won’t damage the original paper. I’ve seen lots of things like this in gardens but nothing lasting. Another option is to get an artist to paint them on wood for you. I have volunteered to coordinate a gardening program for young women working to overcome eating disorders. Too many gardening activities in books or online are very childish, but yours are not. It is very generous of you to share your fabulous gardening activities that we find informative, fun, creative, healing and joyous.